The Capitals enter the 2017 postseason with a strong sense of deja-vu. Their regular season record is almost identical to last year’s (56-18-8), and the record of their opponent is almost identical to that of their first round opponent last season, the Philadelphia Flyers (41-27-14). The Caps enter the postseason as the repeat Presidents Trophy winner, the seventh team to turn that trick since the award was established in 1985-1986. And that brings us to a statistical comparison between last year’s Presidents Trophy winner and this edition of the Caps. 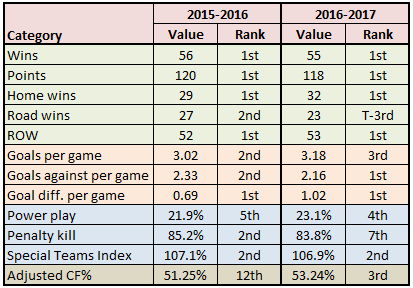 The Caps of 2016-2017 were team similar to, but different from the 2015-2016 edition. On an outcome level the two editions had very similar results in wins and wins in regulation and overtime. However, this year’s team was not quite as balanced between home and road wins, setting a franchise record this season for home wins but being a more formidable team on the road last season. Scoring was more impressive at both ends of the ice in this year’s Caps. Theirs was the only goal differential over 1.00 goals per game in the league this season, a third of a goal better than last season, although they did repeat in having the top goal differential in the league. Despite a sluggish start, the Caps finished this season with a power play that was more efficient than last year’s. In the 2016 portion of this season, the Caps converted just 17.0 percent of their power play opportunities. After January 1st, though, the Caps converted at a 27.9 percent pace, the second best power play in the league over that span (Boston was 28.8 percent). The penalty killers slipped a bit from last year to this, but the real difference was in shorthanded situations faced. Last year the Caps finished having faced 256 such situations (16th most in the league), while this year’s team faced 272 shorthanded situations (5th). This is not the direction one would have hoped the Caps would take. On balance, though, the special teams had similar outcomes in terms of their special teams index (power play plus penalty killing percentages), just two points apart and both clubs finishing second in the league in that measure. If there was a significant improvement, it was in Corsi-for percentage adjusted for score, zone, and venue (numbers from Corsica.hockey). A middle-of-the road squad last year finished the year third in the league in that measure. It is an important number. Each of the last four Stanley Cup winners and six of the last nine were top-three in adjusted Corsi-for percentage in the regular season. Last year’s opponent in the first round – the Philadelphia Flyers – was a somewhat conventional bottom-half of the draw opponent. They scored (2.57 goals per game) and allowed (2.56) goals in roughly equal portions. And, they were a team that had a balance of veteran production (Claude Giroux, Wayne Simmonds, Jakub Voracek) and contributions from the 25 and under set (Shayne Gostisbehere, Sean Couturier, Brayden Schenn). Toronto has a much different profile. The Maple Leafs are a much more prolific team than the Flyers were, averaging about half a goal per game (3.05) more than did the Flyers last season (2.57). By the same token, they are a bit more tolerant of scoring by opponents, allowing about a third of a goal more per game this season (2.85) more than did the Flyers last season (2.56). The big difference is in the dependence on production from rookies by the Maple Leafs. Nine rookie skaters dressed for Toronto this season, six of them in at least 77 games (Auston Matthews, Nikita Zaitsev, Zach Hyman, Connor Brown, William Nylander, and Mitch Marner). The group of nine rookies accounted for 123 of the 250 goals scored by the Leafs this season. Toronto had four of the top eight rookie goal scorers in the league (Matthews: 40/1st; Nylander: 22/4th); Brown: 20/T-5th; Marner: 19/8th). the not-so obvious key skaters for Washington? For the Caps, the notion of the “obvious” key skater is a bit more nuanced than one might think on first examination. Clearly, Alex Ovechkin has to be a force in this series. This is true for any series in which the Caps find themselves. But the “obvious” key skater here might very well be Nicklas Backstrom. In his first three postseasons with the Caps, Backstrom was 12-18-30, plus-13, in 28 games. However, his production dried up in the 2010-2011 postseason (0-2-2, even, in nine games), and it has never really come all the way back. In his last five trips to the playoffs, he is 8-24-32, even, in 55 games. Last spring he was more Backstrom-esque, going 2-9-11, plus-3, in 12 games. He will need to be at least that productive in this postseason. The not-so-obvious key skater might very well be Dmitry Orlov. Last spring, Orlov managed a single assist in 11 playoff games, part of a general lack of production from the blue line that had John Carlson contribute 12 points in 12 games, but saw just eight assists (no goals) from the other seven defensemen to dress. Orlov finished the 2016-2017 regular season with career highs in assists (27), points (33), plus-minus (plus-30, one of just five defensemen in the league to finish at that level or higher). The Caps were 23-4-2 this season in games in which Orlov recorded a point, and he recorded only 14 “minus” games in playing all 82 contests. It was a solid season for the five-year pro, and he could be something of a “secret weapon” in this series and going forward. And for the Maple Leafs? This is Auston Matthews’ first spring NHL rodeo. All eyes will be on him, and it is justified. He became the 19th player in NHL history to record 40 or more goals in his rookie season and the first since Alex Ovechkin did it in 2005-2006. He is the third youngest rookie to accomplish that feat, only Sylvain Turgeon (40 goals as a 19 year old in 1983-1984O and Dale Hawerchuk (45 goals as an 18-year old in 1981-1982) being younger. And, he certainly is the straw that stirs the drink. Toronto is 19-5-8 in games in which Matthews scored a goal this season, 21-22-7 in games in which he was held without a goal. The Leafs are 12-20-4 in games in which he did not record a point. Quality of competition has not been a too-difficult obstacle for Matthews, either. In 24 games against playoff teams out of the Eastern Conference this season, he is 10-12-22, plus-6, including 1-2-3, even, against the Capitals. As for the not-so-obvious key player, perhaps look to Roman Polak. On a club with this much skill, this is an odd choice, but on a club that had seven rookies dressing over the April portion of the schedule to close the season, it might fall to a veteran such as Polak to provide a measure of stability. Polak will almost certainly not contribute much offense from the blue line, and he gets what amounts to third pair minutes on defense, but the defenseman has 49 games of playoff experience with the St. Louis Blues and San Jose Sharks. He, Brian Boyle (100 career playoff games), and James van Riemsdyk (46 career postseason games) might have experience as much as anything to contribute to keep the rookies from getting too high or too low in this intense environment. Braden Holtby won a Vezina Trophy in 2015-2016 with numbers that, with the conspicuous exception of his record-tying wins mark, were arguably inferior to this year’s numbers. He did finish with fewer wins this season than last (42 to 48), but his goals against average was better (2.07 to 2.20), his save percentage was better (.925 to .922), he had more shutouts (nine to three), and his even strength save percentage was better (.935 to .928). If there are a couple of concerns about Holtby, both have to do with consistency and are flipped images of one another. Last year, Holtby had 42 “quality” starts (as noted at hockey-reference.com, defined by “Hockey Abstract” author Rob Vollman as a save percentage greater than the average save percentage for the year or higher than .885 is 20 or fewer shots faced). That was 63.6 percent of his starts. This year, he had 39 quality starts, a 61.9 percent mark. Then there are the “really bad starts (defined by Vollman as having a save percentage less than .885)." Holtby had six in 48 starts last season, but he had eight in 42 starts this season. The simpler way of putting it was that this season, Holtby was Longfellow’s “little girl with the curl.” In Holtby's case, when he was good, he was very good indeed, but when he was bad he was horrid. Fortunately, "horrid" is still a rare occurrence for him. Holtby is 6-2-1, 2.17, .931, with one shutout in his regular season career against Toronto. Toronto will come into this series at a disadvantage in goal, and that is if Frederik Andersen is completely healthy. There are 22 active goaltenders with at least 25 games of playoff experience since the 2005-2006 postseason. Of that group, Andersen is 19th in goals against average (2.34) and 14th in save percentage (.916). Compare that to Holtby, who tops the list in each category. And to some extent, Andersen was something of a passenger on the Toronto express this season. His regular season goals against average (2.67) ranked 22nd of 35 goalies with 2000 minutes played, and his save percentage (.918) ranked 13th. Good numbers, but not among the league’s top tier. On the other hand, Andersen has never lost to the Caps in regulation time in the regular season. Yes, it is a small population of games (2-0-1, 2.67, .909, with one shutout). If Andersen has any lingering effects from his collision with (ok, his being run over by) Pittsburgh’s Tom Sestito in the Leafs’ playoff clinching 5-3 win last Saturday, it will be Curtis McElhinney in goal. The nine-year veteran playing for his sixth NHL team is more of a backup goalie than one who can be thrust into a playoff series as the number one netminder and expected to make wonderful things happen. His playoff experience is limited to 34 minutes of one game in 2009 with the Calgary Flames, and his career record against the Caps (1-3-0, 4.23, .863) will give no Toronto fan comfort. As much, if not more than any first round series, this one features coaches who do not lack for experience. Between them, Washington’s Barry Trotz (1,442, regular season games) and Toronto’s Mike Babcock (1,114 games) have more than 2,500 games of regular season coaching experience. They have more than 1,300 career regular season wins between them, Trotz with 713, Babcock with 596. It is with the post season fork in the road where these similar records take different paths. Babcock has 82 post season wins on his resume – fourth highest total among active coaches (second among currently employed coaches to Joel Quenneville, depending on the fate of Ken Hitchcock and Darryl Sutter in the weeks to come) – and he is tied with Toe Blake for tenth place on the all-time playoff wins list among coaches. There is also the Stanley Cup on his resume (2008 with the Detroit Red Wings) to go with two other conference championships. But here is the thing. For as much grief as the Capitals have had in not advancing past a second round of the postseason in the post-2004-2005 lockout era, Babcock has not advanced past the second round since he took the Red Wings to the Stanley Cup final in 2009, and he has not coached a second round game since 2013. Barry Trotz might be looking for a measure of vindication in this postseason, or at least that what fans might be thinking. His regular season success with the Nashville Predators and the Caps (a .559 career winning percentage) has not been extended to his playoff experience. He brings a record of 32-44 into the 2017 postseason, tied with Sid Abel for 85th place in winning percentage (.421) among 104 coaches with at least 20 games of NHL playoff experience. In 17 years as an NHL head coach coming into this postseason, Trotz has never led a team past the second round in his nine trips to the postseason, the roadblock he has encountered in each of his last four trips to the playoffs (twice with Nashville, twice with Washington). In previous years, he had a hard working crew in Nashville that was in a bit over their heads, skill-wise, in the postseason. That will not be the case with Washington. Since 2007-2008, the Washington Capitals have the best home regular season record in the league (253-97-43/549 points). Over that same span of time, the Caps are 25-19 at home in the postseason. Their .568 winning percentage is ninth among the teams appearing in the playoffs over that span. Over that same span of years since 2007-2008, no team has lost more postseason games in overtime than the Caps (15). They are tied with the New York Rangers in that regard. Washington was eliminated in overtime in each of the last two postseasons, by the Rangers in Game 7 of the Eastern Conference Semifinals in 2015, and in Game 6 of the 2016 Eastern Conference Semifinals by the Pittsburgh Penguins. If Toronto presents a different profile for the Caps and different challenges, do they present a bigger challenge for Washington than did the Flyers, who extended the Caps to six games in the first round last spring? Put another way, the Leafs have a puncher’s chance in the first round. Toronto has skill, especially among the forwards, and if they can play an up-tempo game they can take advantage of the speed advantage they will have against the Washington defense. They will need it, though. Toronto’s defense and goaltending do not appear to be sufficiently skilled or deep to carry the Maple Leafs through a seven-game series, let alone against a team as experienced, balanced, and skilled as the Capitals. According to the WhoWins.com Web site, a team winning Games 1 and 2 at home in the quarterfinals with the first game at home wins their series 88.2 percent of the time. For a team as young as the Maple Leafs, stealing a win in Washington out of Games 1 and 2 is on the “must-do” list. If Washington, a team with the league’s best home record in the NHL this season, puts Toronto behind a 2-0 eight-ball early, the Leafs might give their fans a thrill with a win at Air Canada Centre, but enthusiasm is not going to be enough to dig the Maple Leafs out of that hole.